It’s only been two years since the release of the latest movie in the Harry Potter universe, but for fans, it feels like a lifetime. To reward them for their patience, and to celebrate the upcoming November 16th release of Fantastic Beasts: The Crimes of Grindelwald, London is lighting up the night with giant wand installations. 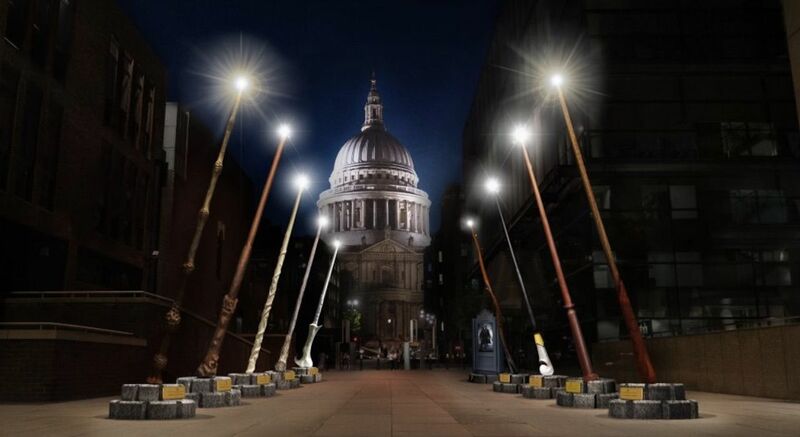 These aren’t the typical wands you’d find at Ollivanders in Diagon Alley; they’ll be 15 feet tall, and located between the Millennium Bridge and St. Paul’s Cathedral. In addition to celebrating the movie’s release, the wands are meant to draw attention to J.K. Rowling’s foundation, Lumos, which strives to rescue children from institutions and reunite them with loving families. The installation will also mark the start of Wizarding Wednesdays during the course of the next month. Taking place every Wednesday in London, the event will feature a variety of wizarding activities, including a live military band performance of music from the Harry Potter and Fantastic Beasts films. The wands will be on display from October 18th to November 12th, lighting up at 6:45 PM each evening.